This species is accepted, and its native range is Tropical & Subtrop. 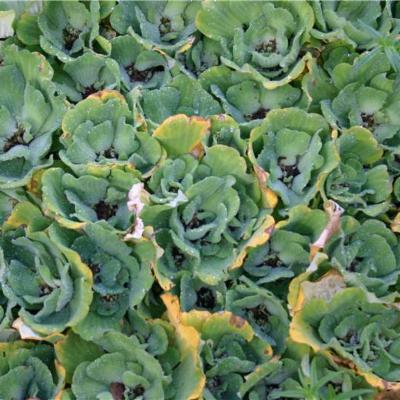 LEAVES sessile in a rosette, 1-5 in. long, 1-2 in. broad, cuneate-oblong or cuneate-obovate, notched or entire at the broadly rounded or subtruncate apex, more or less pubescent on both surfaces, tomentose with long matted hairs at the base. INFLORESCENCE: Spathe 31/2-5 lin. long, more or less hairy or villous outside, glabrous within, pale green; limb ovate, subobtuse, with a broad white ciliolate margin. Ovary pale green, pubescent. Neuter organs frill-like, pale green. Anthers dirty white. Morphological characters are the same as those of the genus. Plants aquatic, floating. Roots many, pendulous in water, feathery. 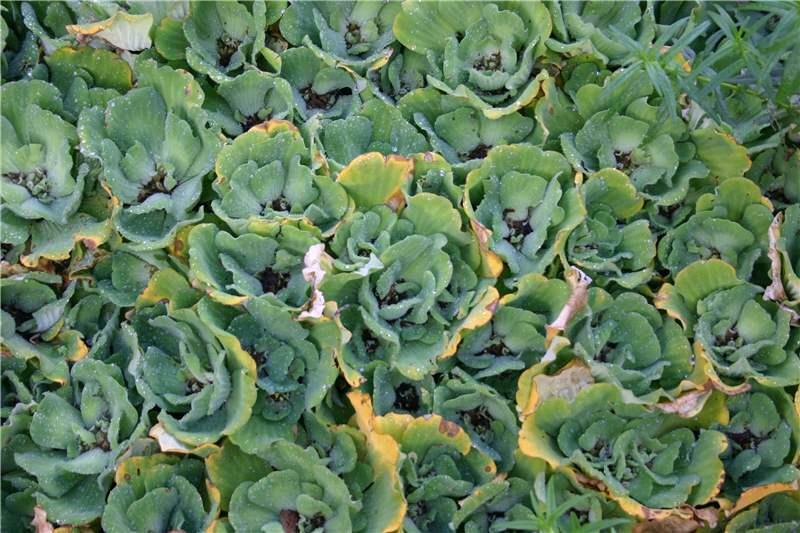 Leaves in rosettes, 1.3–10 × 1.5–6cm. 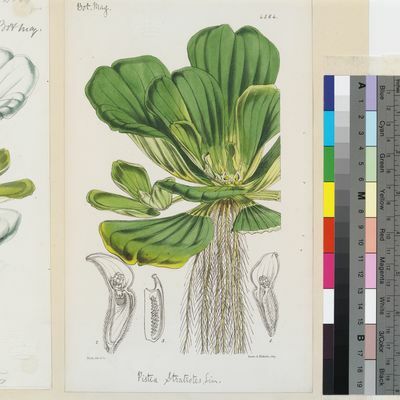 Spathe white, 5–12mm. Widely distributed in the warmer regions of both hemispheres. Tropical wetlands; floating aquatic in open, tranquil, freshwater habitats. Plant reproducing vegetatively by stolons. Leaf-blade up to 14 cm. long, 8 cm. broad, spathulate, obconic or oblong, apex rounded to truncate, green, paler and more densely pubescent beneath; main veins 5–7, prominently winged beneath. Spathe to 1.3 cm. long, whitish green, margins and exterior fimbriate-pilose. Berry to 0.5 cm. long, 0.3 cm. broad. Seeds to 0.2 cm. long, 0.1 cm. in diameter, reddish brown. 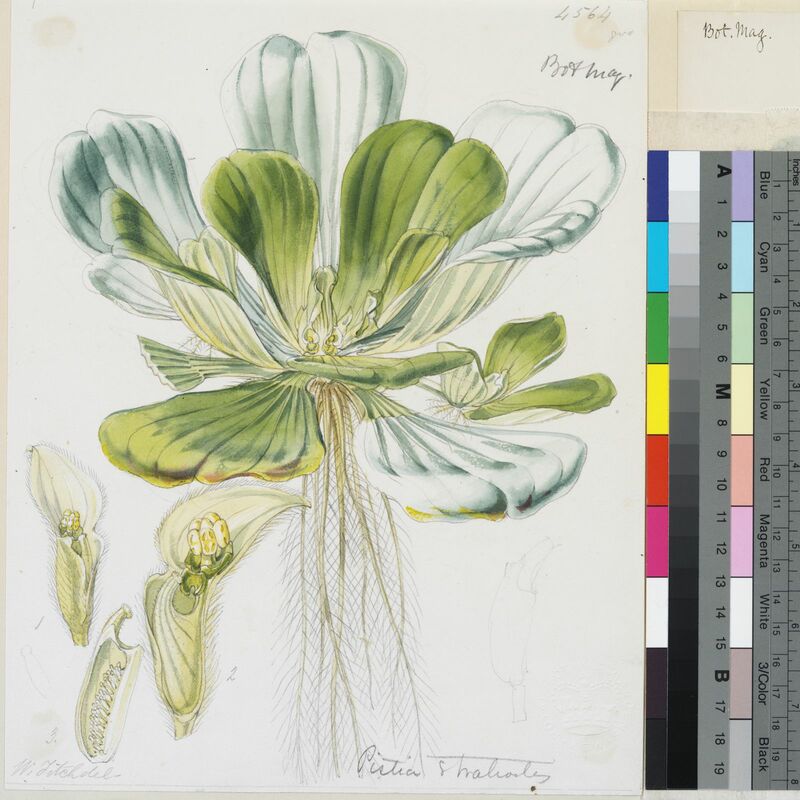 Open, still, freshwater; 0–1800 m.
Nativa y cultivada en Colombia; Alt. 0 - 2000 m.; Amazonia, Andes, Llanura del Caribe, Orinoquia, Pacífico, Valle del Cauca, Valle del Magdalena. 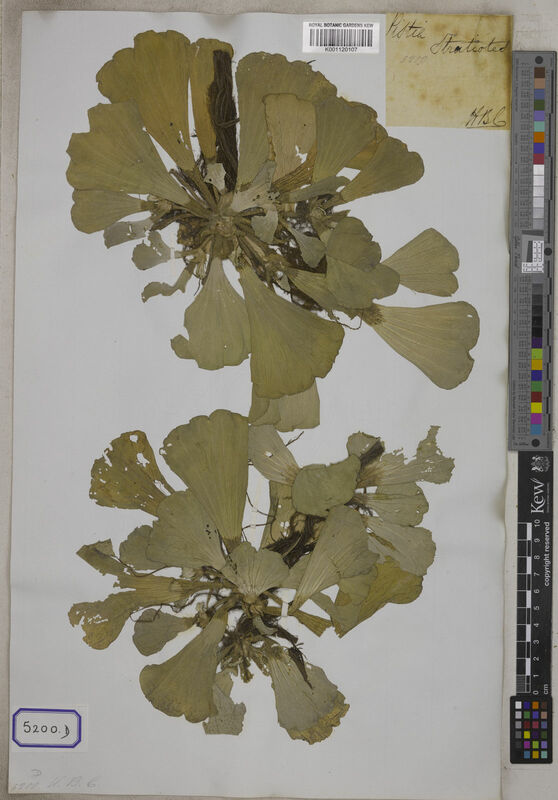 Flowers obscure beneath the rosette of glandular viscid leaves. 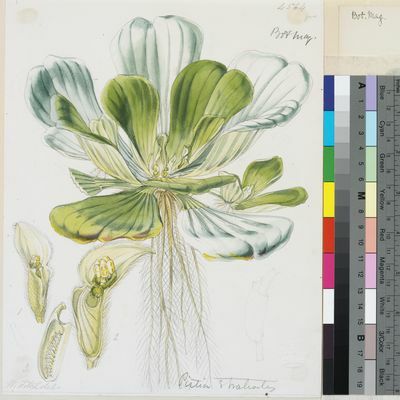 Pistia stratiotes var. 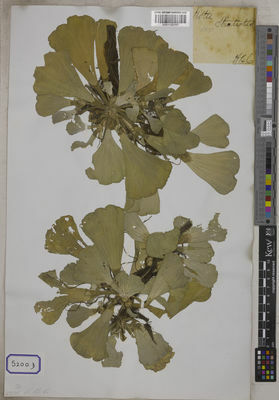 obcordata (Schleid.) Engl. Gomes Gonçalves, E. & Nadruz Coelho, M.A. (2009). Araceae Flora dos estados de Goiás e Tocantins 39: 1-109. Universidade Federal de Goiás. Arias Granda, I. (1998). Flora de la República de Cuba, Ser. A., 1(1): 1-46. Wild in Kirkia 2: 13, t. 2. Vollesen in Opera Bot. 59:108 (1980). Bogner in Fl. Madag. 31: 66, t. 12 (1975). A.D.Q. Agnew, Upland Kenya Wild Flowers p. 706 (1974). R. O. Williams, Useful and Ornamental Plants in Zanzibar and Pemba p. 414 (1949). Peter in Nachr. Ges. Wiss. Göttingen, Math.-Phys. Kl. 1929 (3): 187 (1930). Engl. in A. Engler, Das Pflanzenreich 73 (IV. 23F): 259, fig. 63 (1920). N.E. Br. in Flora of Tropical Africa 8: 140 (1901). Engl., Die Pflanzenwelt Ost-Afrikas und der Nachbargebiete, Theile C: 132 (1895). L., Sp. Pl. : 963 (1753).